Are you worried about the security level of your home or business? Sometimes basic security falls short when it comes to securing your belongings. You never know when some intruders will break into your place, so it is wise to enforce the security. If you don’t want to put your possessions and life at risk and end up paying costly liabilities for the security breaches, consider installing high-security grade 1 locks in your home or business. At San Antonio Car Key Pros, we understand the importance of security for your home and thus provide you with the best high-security grade 1 lock installation and repair services. Why Install High-Security Grade 1 Lock? High-security grade 1 locks are the most robust and durable lock made out of highly advanced components. Rendered with a locking mechanism that is hard to break, it makes an efficient option to keep your security in check. By installing a high-security grade 1 lock, you can minimize the risk of illegal access or theft in your property. Being incredibly durable, this lock will provide maximum security to any home or office. When installed correctly, this lock will give you peace of mind by enhancing your security. If you are looking for an expert high-security grade 1 lock installation service in San Antonio, Texas, San Antonio Car Key Pros is the one to rely on. San Antonio Car Key Pros is a leading professional locksmith with 5 + years of experience in the industry. We have a prompt and reliable team who can efficiently handle the high-security grade 1 locks installation and repair regardless of its type and complexity. We are accredited, bonded, and insured so you can have confidence in our lock service. Our expert team takes care of your complete safety and security while mounting the lock. Just give us a call, and we will show up at your place in 30 minutes. No matter day or night, we are available 24/7 and 365 days a year. We offer fair and upfront pricing and don’t surprise our clients with any hidden fees. 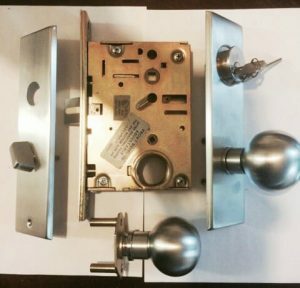 If you already have a high-security grade 1 lock installed in your home or office and need help with the repair, we will do it for you. Our latest equipment and tools and expert technicians enable us to provide fast repair service, and we handle every residential or commercial locksmith service promptly. We have the expertise to repair all type of vintage or modern locks by reputable brands. With us, you will get exactly what you are looking for at an affordable price. We make a difference with our honest price and genuine concern for the security of our clients. Our licensed, bonded and insured technicians can manage all type of high-security lock installation and repair service and stay updated with the latest tools and technology. With an aim to offer fast, reliable and efficient service, we implement proper methods to get your lock installed right in the first time. Our experience and knowledge enable us to deliver high-quality locksmith solutions that last longer. Best of all, we provide 30 minute or less response time no matter what. Plus we offer 24-hour availability to be there to help no matter whenever you need us. Contact us whenever you need a superior high-security grade 1 locks installation and repair service and we will gladly help you out. You can also trust on us with complete locksmith services including lock rekeying, lock change, car fob installation, trunk lockout services and much more. Rely on the expert at San Antonio Car Key Pros to keep your commercial or residential property safe and secure with superior high-tech grade 1 locks installation service. High-Security Grade 1 Locks Installation And Repair https://carkeyssanantoniotx.com/lock-service/high-security-grade-1-locks/ 4.5/5 based upon 11 reviews.